The Cristian Rivera Foundation gathered supporters, Committee Members and paintball lovers alike for the foundation’s First Annual Paintball Tournament. Teams competed from 8am to 12 noon at NYC Paintball in Long Island City on Saturday December 3. It was a morning filled with high-energy but good-spirited competition. The main goal was not to win—though victory was certainly sweet for winners Team AVS. The true goal of the day was to raise money toward finding a cure for DIPG, a rare, inoperable brain stem tumor that takes the lives of 200 children in the United States each year. 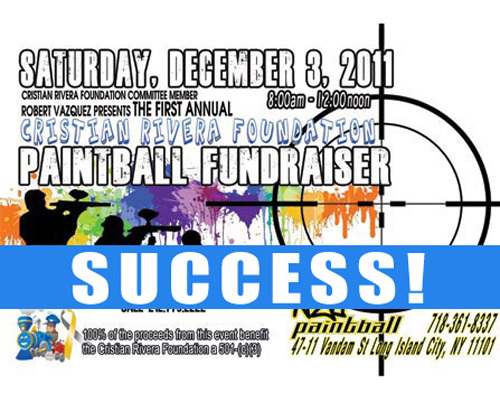 All of the proceeds from the First Annual Cristian Rivera Foundation Paintball Tournament went toward that goal. If you missed this amazing event, visit www.cristianriverafoundation.org where new events are being announced all the time. You can also use that link to make a donation and help find a cure for DIPG.